Ocean flight with no experience! Hello everyone, we really need your help, tips and advice! We are a small production company, Film Nation (www.film-nation.com) and we were hired to produce a 1 minute TV spot for a major Cruise line in one of the biggest ships in the world. We are departing in 3 days and we are ready to shoot, with all our camera equipment, except one little detail: we are taking a Phantom Vision 2 plus to do some aerial shots but we have no experience at all in drone piloting. We just got the drone yesterday so we our learning in express mode as fast as we can. Tomorrow we are practicing in outdoors and we hope with a good enough wind so we can learn how to deal with it in the middle of the sea. As you all know we have to be really carefull not to fall into the ocean, and to get the drone back to the ship. In the ground station function of the dji vision app I found out I can set a dynamic home point so the drone flies back to the ship which will be in motion all the time, but my first big concern is that when Ive been practicing yesterday and today, the app crashes when going to that function in my iphone 6! Should I set something off? should I reinstall it? Imagine that happens in the middle of the flight in the middle of the sea! ok, I know, first rule, "don`t panic" but I need to know all the possibilites I could face in order to react the best possible. Another concern is wind, how can I know how many wind the drone can stand?. There are 3 kind of shots I would love to do: 1st the simplest one: a)take off looking at me, b)fly away until I have a full panoramic view of the whole ship,c) fly back to home (me) still facing towards me so I dont have to concern about the camera but the flight. 2nd shot: a Big panoramic circle around the ship which I dont think I will do at least not complete because I need to have it in sight all the time, so maybe a half circle as long as I keep visual contact with the drone. 3rd shot take 1: My santa claus wish is a) to fly away, b)position the drone the lowest possible to the ocean surface, c) fly fast towards the ship at that same low position, d) pass through the ship discovering all its majestuosity, e) leave it behind the drone which will always keep the same view position in the whole tak, f) fly back. 3rd shot take 2: Do the same but with the camera always facing not to the flights direction but to the ship. This would be a long panning shot in exactly the same flying action described in the previous take. So, thanks for your help, tips, and good vibes. Promise to show all of you the result! It takes only 5 minutes to learn to fly the Phantom - but it takes a lot of practice and experience understand all the things that can go wrong and how to make sure they don't happen. I don't think it's realistic to expect to get the necessary experience in 3 days to do what you are hoping. On a ship at sea you really need to know what you are doing and be very familiar with everything about the Phantom. When things go wrong at sea, it's not a forgiving environment and you usually don't get a second chance. What you're proposing has a high probability of ending badly. One particular problem you are likely to have to deal with is the compass on a steel ship. DON'T try to calibrate the compass on the ship - do it on land before you sail. Here are some good ship pics I've taken to show you what's possible. Thanks for your honest advice, I really agree with you and even if I have the drone with me I might not use it. Great pictures! Take a look at this project we shot one week ago, of course, with an experienced drone pilot. Film Nation - APM Terminals México. Arrival of the STS cranes to Lazaro Cardenas.. This other video Film Nation - SANKI GLOBAL Summit 2015 Océano Azul "Veleros" Nueva Ola was shot 5 years ago with an ultralight aircraft, before drones arrived. The original had only one sailboat, this version with the cgi sailboats is a recent update. Take a look at this project we shot one week ago, of course, with an experienced drone pilot. Film Nation - APM Terminals México. 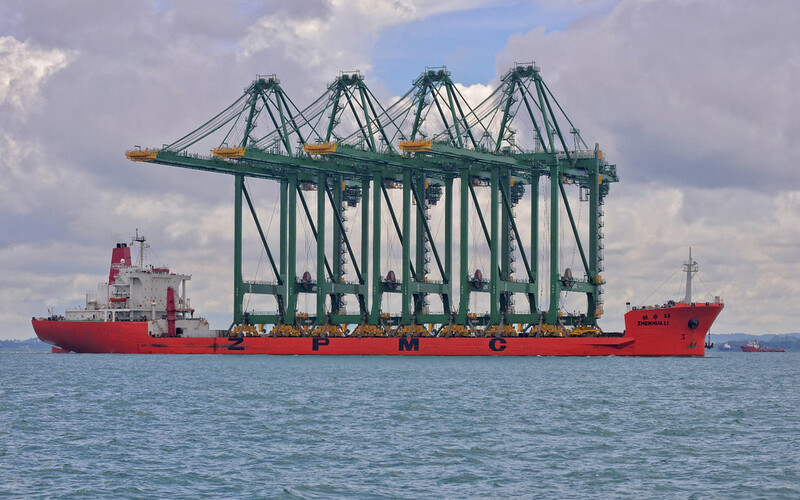 Arrival of the STS cranes to Lazaro Cardenas. Those are both great videos. You do nice work. I've only seen a container crane delivery once. I'd love to shoot one with a drone. Thanks! Lets see what happens, in one week I hope to have good news! Meta4 is right when he mentions 5 minutes to learn how to fly but it is really the unknown that you need to be ready for. What other quad experience do you have? If this is your practise run with a drone then concentrate on orientation and never let it out of sight, a spotter is a good idea. For what you are planning to do and want to do I would recommend you getting in some more flight time and experience. If not be prepared to lose your drone. Three days is not enough time to lean the quick thinking and steps to avoid a disaster. You need to know how to jump from GPS to Atti maneuver the jump back to GPS in a split second. That can save you from a crash and destruction. It's even tougher on a moving vessel doing 15-20 knots and an ocean breeze to fight also. I'd wait a while until I was a seasoned pilot to tackle that one. Sorry but just the facts! I'll just say flat out that you will not be able to pull off anything but maybe the simplest flight out and back to the ship. And certainly not just a few feet above sea level. The red flag in all of this is you are actually hoping/planning on trying these things after a few days of owning a Phantom, which just shows that you have no idea what a successfully flying of a drone involves. But good luck. At least enjoy the food. Make sure each flight video is downloaded from the SD card to your phone or laptop after each flight. Otherwise, if you lose the drone and its SD card on the 6th flight, you will lose all of your prior videos. Also. keep in mind that cruise ship decks are jam packed with people, with a lot of kids running around. It's a dynamic moving environment with unpredictable wind aspects which will make it really easy to hurt someone if you don't know what you are doing. Be prepared to lose your drone in the drink. It's hard enough to learn to fly in a big open field with no trees and soft grass but the ocean environment is tough. Metal decks screw up the compass not to mention the pitching and rolling involved. Winds, both true and apparent wind, will make it very difficult to stay clear of the ship's structure. The cinematic shots you describe are possible with an experienced pilot but would be easier with a comparable 3DR Solo drone where its programmable. I would suggest you fly carefully to get a few simple but dramatic shots before losing it in Davy Jones locker. DJI screwed up the latest app update 1.0.52 which crashes Ground Station. Until they come out with a fix some are pulling the earlier 1.0.48 from their iTunes which continues to work. Good luck.